Kumano Hongu Shrine (熊野本宮大社) is one of three Kumano Grand Shrines. There are thousands of Kumano Shrines in Japan, and this is the most important of them. Located in Wakayama Prefecture, the shrine was established over 2,000 years ago and it enshrines twelve gods of Kumano Gongen. The main god of the shrine is Ketsumimikonoookami, and Yata Crow, the three-legged crow, is the messenger of this god. As the one of great historic sites of Kumano, it is registered as a UNESCO World Heritage Site. 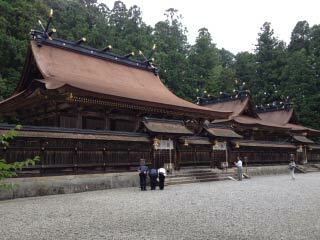 To worship at Kumano was highly respected and many people including emperors have prayed at this shrine. Parking and restrooms are available. 0. Travel to Shingu Station. 1. use the local bus service to Kumano Hongudaisha. Kumano Hongu Shrine appears in Japanese Myth. Kumano Hongu Shrine was established by Amenohoakari no Mikoto, the brother of Ninigi no Mikoto. His descendant, Takakuraji served the first Emperor Jimmu. Also at the same moment, Yata crow, the messenger of Takamimusuhi no Kami, and the crow lead them to Yamato. The 10th Emperor Suijin enshrines the gods of Yamato, and established the grand shrines at Ise and Kumano. The 13rd Emperor Seimu set up the land of Kumano, and addressed the descendant of Takakuraji rule the land of Kumano. This story tells that Kumano Hongu Shrine is also belong to the line of Japanese gods. It has high respect of Sun. Yata Crow is also the god of Sun. So, it presents the resurrection of Sun, and salvation of the future. Legend also said, Ketsumimikonoookami taught the technology of shipbuilding, this shrine had been also respected as the guardian of seamen. The remarkable note is that records says the emperors and their relatives worships 100 times this shrine during Heian period. This shrine and its Pilgrimage Routes that called Chuhenro are registered as UNSECO World Heritage Site. In 1889, there was huge flooding and many of historical building were lost. The shrine was moved to the top of hill located near. Some of remaining buildings were also moved to the current location. The former location is called Oyunohara, now. It is very important to worship all three Kumano Grand Shrines. Kumano Shrine helps salvation of our three lives. Hayatama Shrine helps the salvation of the pervious life. Nachi Shrine helps the salvation of the current life. Hongu Shrine helps the salvation of next life. Kumano Shrines are highly respected for over thousands of years. Yata crow safe driving Matsuri: Jan 2. Yata crow Shinji: Jan 7. "Sacred Sites and Pilgrimage Routes in the Kii Mountain Range."